Every year it seems, I come to a point where I am a bit burned out on caring for my houseplants. I don't imagine that this is much of a problem for those sensible folk who have a plant or two or ten. But for us obsessive houseplant lovers with thee-digit collections, this can be devastating to both one's morale and for the health of the plants. I feel down and overwhelmed, so I slack off a bit on plant care. (I let things go a bit too long between watering; I don't check for pests; I skip routine grooming; stuff like that.) Because I've slacked off, the plants start to suffer, (they wilt; pests appear; the plants look messy) so I feel even more down and even more overwhelmed. It becomes a bit of a vicious circle. Phalaenopsis and Pelargonium flowers. Photo is for decorative purposes only, as it doesn't really relate to the content of this post. In order to keep this from happening, or at least not let things get too bad, I've started to look for causes and cures. I have too many plants. Well, this is the major issue. I fully admit that I have too many plants indoors in the wintertime. Succulents make up one third of my collection, and most of them spend the warm months outdoors. Taking care of them outdoors is a breeze; they can be watered en masse with the hose, if they need watering at all, and just being outside in the summer is a pleasure for me. 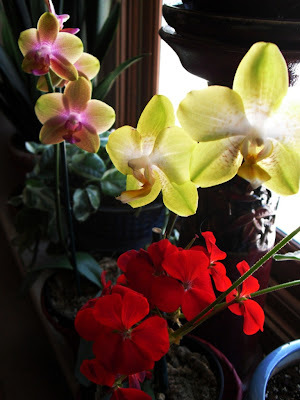 Indoors, they add a lot of time and effort to my routine, and my house looks overcrowded. Since, so far, I have not been prepared to significantly reduce the numbers of plants, I know that this something I just have to handle with the best grace I can. I have too many high-maintenance plants. While this is not the case right now, having to deal with large numbers of fussy plants that need special treatment (temperatures other than normal household temps, frequent watering, high humidity) has driven me to despair in the past. I have large tasks that need to be done all at once. One example of such a task is when a sudden dip in temperatures in the fall leaves me compelled to bring all plants that have been outdoors back in at once. Making a mad scramble to get things in, making sure that they are free of outdoor insects, and finding a place for everything can wear me down and make me wonder why I bother at all. I have non-plant related sources of stress. Sometimes things don't go well in life. Personal problems of all kinds can sap my energy and make plant chores the last thing I feel like doing. I give myself permission to be imperfect. Not all my plants are going to look beautiful all the time. Everything has its ups and downs. I remind myself that most plant tasks can be postponed for a few days without serious consequences. But even if such consequences occur, I am not a bad person if a plant suffers a setback or even it one dies. I give myself permission to throw plants away. If a plant is struggling and it will take more time, effort, and valuable growing space than I think it is worth to save it, it is okay to throw it away. If a plant is buggy, and it will take major work to eliminate the infestation (and there is always a risk that it will spread) it is okay to throw it away. If I just plain don't like a plant, for whatever reason, it is okay to throw it away. Really. Allowing myself to do this has probably been the biggest plant-related stress reliever of them all. Relax. I try to make caring for my plants a relaxing activity. I remind myself that this is a hobby I chose because I enjoy it. By the way, this post was not motivated because I am suffering burnout right now. While I do find this time of year a mite stressful as a plant hobbyist, because these darkest days of winter can be stressful for the plants, I am actually quite happy with the way things are going these days. A belated Happy Solstice to everyone. Things can only get brighter from here on! Having a moderate case of plant burnout myself at the moment. I don't have very many high-maintenance plants, and although it probably looks to an outside observer like the plants are overcrowded in here, I'm used to it, so that doesn't bother me. And regular life is fairly non-stressful, at least compared to how it was during the spring and summer, so it's not really that either. My main problem is the large-tasks-that-have-to-be-done-all-at-once one. Watering is always a large task, I always feel pressured to do it quickly (lest the plants suffer drought stress), and it needs done about every two weeks. So I'm always either trying to steel myself to do it, doing it, or trying to recover from having done it. I only really mind this when I'm in the mood to work on blog posts and can't because plants have to be watered instead. But that happens more often than you'd think. Lol, I suffer from plant burnout from time to time, and I only have 14 plants! I make sure only to buy low-maintenance plants, because I know I'll neglect them from time to time. Except for 2 Dracaenas, all of my plants are cacti or succulents. I get semiannual plant burnout, once in the garden in late summer, once indoors in late winter. Luckily my interest in each realm is the cure for the other so it all works out! I am definitely most likely to get bored with houseplants around March or April, and I have to make myself follow through and water them because I'll be sad later when I do care more. Thanks all, for the comments. I'm not surprised that plant burnout isn't uncommon. I'll take comfort from that, the next time I experience it. Anything that requires work, even if it is work we love, can get us down at times.